I can’t be the only one who thinks that Top Gun is one of the Top 20 best movies ever made. Maybe it’s because I grew up watching it and playing Maverick, or maybe it’s because I’ve seen it a hundred times, which may not be that much of an exaggeration. Whatever the reason, it became a film I knew by heart and one that left a lasting impression on me. 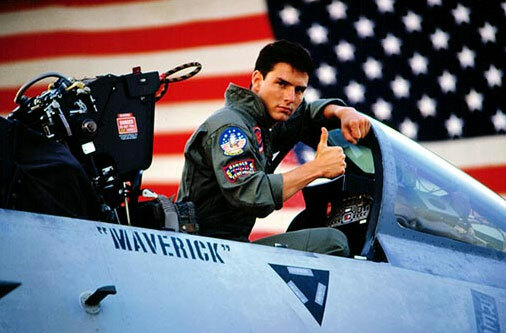 I think it’s why I give Tom Cruise a little more leeway than some people do, because I’ll always picture him as my favorite fighter pilot, a fly-by-the-seat-of-your-pants hero. I imagine that most Americans have seen this movie, at least on TV, and know it pretty well. But on the off chance that it’s been a while, as was the case with me when I sat down to watch it on DVD from start to finish, do yourself a favor and refresh your memory with one of the greatest. Top Gun is a naval flight school, a place where the best of the best face off to hone their air combat maneuvering; dog fighting. And when Maverick & Goose get the chance to train at this elite facility, the best friends can’t believe their luck. But it’s not all fun & games. The most talented fighter jet pilots in the country are gathered here to improve their craft and to take home the Top Gun trophy. Maverick’s toughest competition is Ice Man, a pilot who makes no mistakes, who takes out his enemy with an icy cool. But Maverick’s past might be an even bigger hurdle than Ice Man’s smooth flying. His father was a Navy pilot too, lost in a classified battle, and Maverick flies against his ghost every day. In order to be the best, he’s got to learn to let go, to trust others, and to fly with no fear. I’m not sure there’s a more iconic film than Top Gun. It’s director Tony Scott’s biggest moment, it’s Tom Cruise’s signature role, and it’s just so 80s. From the soundtrack to the catch phrases, it’s a movie that makes an impact, and one that you will never forget. It’s still one of the coolest movies you can watch, with missiles & explosions, bogies & bailouts, motorcycles & beach volleyball. Cruise is perfect as Maverick, the hot shot who hates to lose. Anthony Edwards as Goose is stellar as well, the faithful companion who always believes in his best friend. Val Kilmer, Meg Ryan in a small role, Tom Skerritt, Tim Robbins, Kelly McGillis; a who’s who of the 80s & 90s. I will always love this movie; its humor, camaraderie, testosterone, and general magic. A must see, must re-watch, must-own cinema icon.